I arrived back in the South Bay a little more than a week ago. I hadn’t seen my best friends in person in a very long time. Between an inexplicable ending to a relationship and a general dissatisfaction with life I was in unchartered territory - physically, emotionally, and psychologically lost. I felt sick and needed to be reunited with my best friends. I desperately attempted to fill that void with humans. How could I have been so ignorant? The sun had already set by the time my parents picked me up from the airport. After the usual stop at In n Out and a short ride home I was reconnected with my best friend, first love, and ultimate companion. My dog, Gracie, is all of those things and more. For 13 years she has kept me company and guided me in my search of The Goodland and continues to do so to this day. She is 91 in dog years and can no longer make the walk down to the beach with me to check the surf before the lifeguards come on duty. We’ve been doing this for years and there is nothing I cherish more. If she wants to go I will always find a way to get her down there. However much of a hassle loading up the car is I would do it a hundred times over if it means keeping our tradition alive. There is something about the sand and ocean that briefly turns back the clock. Her old, arthritic hips loosen up. Her labored breathing becomes effortless. As soon as we hit the sand she took off. I didn’t even know she could still run. Part of me thought she would stop before the water. Then I remembered she was my dog. Childhood memories of me sprinting ahead of my parents down the berm and into the water came flooding back. That look you give your parents for the okay right before you go in? Gracie gives me that same look out of courtesy. No amount of food or tennis balls could stop her from getting in the water. I sit down and watch her run in and out of the surf. She times her entries rhythmically with the waves, just as a human might. 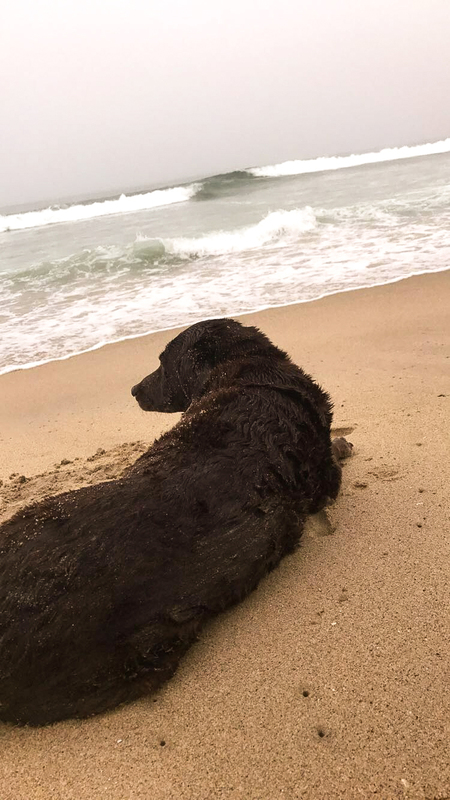 She got out of the water and rolled around for a little before ending up next to me looking out at the ocean. With my wet, sandy, and smiling chocolate lab by my side my mind was at ease. In this moment I had completely forgot what I came down here to do, check the surf. It was 2-3ft and the tide was dropping. Ideal conditions for a guy who had been stand-up paddling on rivers and surfing behind boats for the past couple months. I drove Gracie back up the hill, grabbed my board, and ran back down. Finally. I was back where I belonged. I had left my companion at home to return to my mistress, the ocean. The paddle out was easier than normal. A thick marine layer kept me hidden from the world I was paddling away from. Dozens of dolphins swam by, graciously oscillating through the water. They would sometimes turn towards shore and effortlessly catch a runner out the back. I had surfed in the presence of dolphins before, but not this many and not this close. It was a welcome home that I am still struggling to articulate. I flipped my board around and paddled into my first real wave of 2017 on my 9’6” Stewart longboard. Four easy strokes and I felt the wave take over, as effortless as I had remembered. I popped up and saw what I was working with (not much). A quick cross over step and a kick out and it was over. On any other day this would feel like the 3-second ride that it was, but today it felt like eternity. I took nothing for granted for the rest of my time in the water that day. Walking back up to my house my face began to hurt. The water wasn’t cold enough in June to turn my face into an ice cube. I realized that my face hurt because I had not stopped smiling from 6:30am-10am. I had returned to The Goodland and was truly at peace. All of my troubles washed away like the sand off my feet. I have found that when I am deeply troubled, there are things you get from the silent, devoted companionship of a dog and the ocean that you can get from no other source.